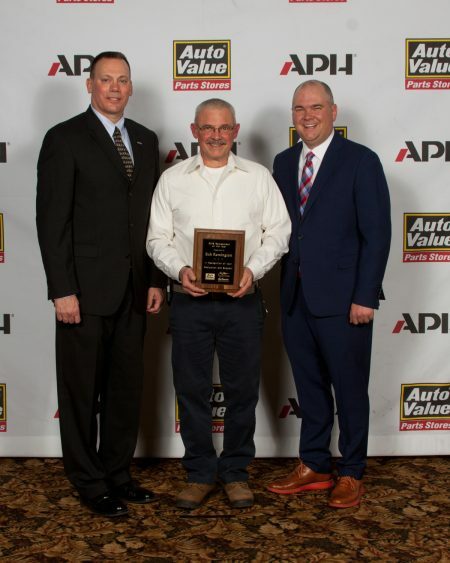 From left: Jim Pascale, vice president of store operations at APH; Bob Remington, outside sales at Pine River Auto Value; and Corey Bartlett, president and CEO of APH. APH named Bob Remington as the recipient of the 2018 Auto Value Salesperson of the Year award. Remington is an outside salesperson for the Auto Value parts store in Pine River, Minnesota. He was recognized during an awards banquet at APH’s annual Winter Conference on Monday, January 21, 2019 at Cragun’s Resort and Conference Center in Brainerd, Minnesota. Each year Auto Value parts store managers throughout Minnesota, Wisconsin, North Dakota, South Dakota, Michigan and Montana have the opportunity to nominate a salesperson they believe deserves the award. Remington has been a part of the Auto Value team since 2013. When not making sales calls, he enjoys spending time with his wife, Renata, and their son, Ben. He also takes pleasure in fishing, hunting, woodworking, traveling, hiking, snowshoeing and photography.